Sheet Vinyl Flooring Experts – Vinyl Sheet Floor Sales, Service, Installation in the Pasadena, MD Area. Sheet Vinyl Flooring Experts – Let us help you select and install the perfect vinyl sheet flooring for your project. 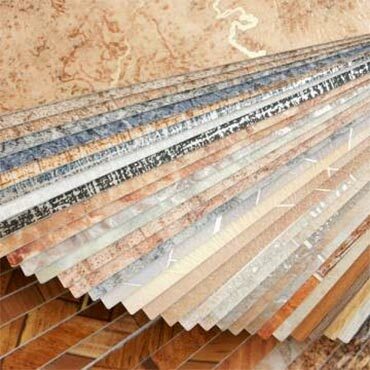 Large variety of vinyl floor samples, colors and styles. - Pasadena Floors, Pasadena, MD. If you’re looking to use vinyl tile or sheet vinyl flooring in your home improvement and interior design projects, you’re not alone. As the most popular type of flooring for areas such as kitchens and bathrooms, sheet vinyl or tile floors offer many benefits at an affordable cost. Sheet vinyl flooring offers durability and resilience unmatched by most any other flooring option. Often referred to as "resilient flooring," sheet vinyl flooring is very resistant to heat, stains, and water damage. High-traffic areas are no match for sheet vinyl or tile floors which hold up to years of heavy use. Sheet vinyl floors are the practical choice for areas of your home such as kitchens, bathrooms, and utility rooms. Sheet vinyl have come a long way from the paper thin vinyl rugs of years past. Sheet vinyl flooring comes in a seemingly limitless amount of colors, styles, and textures to complement any décor. Usually sheet vinyl comes in either 6’ or 12’ rolls, which means you won’t have seams where you don’t want them. Many options are available that closely resemble other flooring surfaces such as wood, stone, ceramic, and slate. Along with the look you need, you’ll also enjoy added comfort and sound-buffering characteristics of sheet vinyl floors. Sheet vinyl flooring comes in a large range of quality, from inexpensive vinyl to high-end cushioned vinyl flooring sheets. With so many options of vinyl flooring available, you’ll want to make sure you choose the perfect vinyl flooring solution that matches your practical, aesthetic and budgetary needs. In addition to beautiful floors, sheet vinyl flooring are also easy to keep clean. All of our vinyl floors have a wear layer that protects floors from stains, spills, scratches and scuffs. With your vinyl floor all you have to do is sweep regularly and mop occasionally to keep your floor looking beautiful. Visit our showroom and browse the selection to find a durable and stylish sheet vinyl flooring in a look to match your décor. Call us today at for a free flooring consultation – we look forward to hearing from you! Pasadena Floors – Proudly serving the Pasadena, MD area since 1994.